At 1.30am, Nationalist Party leadership frontrunner Adrian Delia published the ‘denial’ below on Facebook. Except that it is not a denial at all – and it took him a full three hours after I published this post about his offshore bank account in Jersey to work out how he is going to fox people into thinking he’s denying having a bank account in Jersey while at the same time not actually mentioning the words ‘bank account’. Unfortunately for him, I am no stranger to the weasel-words and linguistic subterfuge used by lots of Maltese lawyers, and I noticed immediately that what he is denying here is not having a bank account in Jersey but having money in Jersey (or elsewhere outside Malta). The two are not the same thing. A lawyer – or anyone else, for that matter – can have a bank account in Jersey but not own the money in it. Or he can use it to process funds for others – clients – in ways that would be high-risk in Malta because they are illegal and banks in Malta, unlike banks in Jersey, are obliged to disclose information. Adrian Delia, in his haste, has forgotten that language is my stock in trade. I never said that he had money stacked outside Malta. I never said that the money in his Jersey bank account was his. On the contrary, it’s far worse than that. There are three separate, distinct issues here. One is the Jersey offshore bank account itself and the nature of the funds processed through it or retained in it. The other is whether those funds were disclosed to the Maltese authorities (it is not illegal to hold an offshore bank account or any kind of overseas bank account, obviously, but it is illegal not to disclose the contents to the authorities back home in Malta). 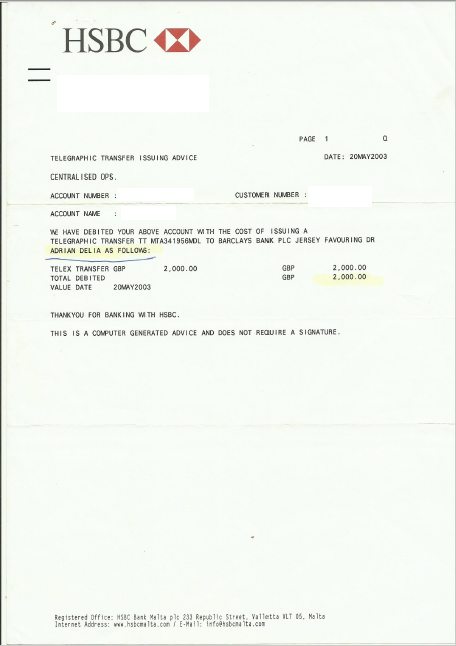 Meanwhile, just to prove that Adrian Delia did indeed have an offshore bank account at Barclays International in Jersey (and probably still does, because those things are so useful that when people have them they never close them down), and even though he’s not denying having that bank account but only denying OWNING money in it, here’s a piece of paper that is incontrovertible. I have removed all personal details of the person who effected the transfer. The story is a lot bigger than this, but it belongs in several separate posts because it is too much for readers to take in at once. I’m still unpacking the thing into its various component parts. But this bank account is central to it. Now Dr Delia has issued an early-hours press release, saying that he is taking me to court and summoning the press to the entrance of the Courts of Justice, where he can pronounce himself hurt and injured by an evil witch who is after his family and five children. What can I say? Yet another liar and fraud files a libel suit as a PR stunt or a form of harassment (in this case, the former). 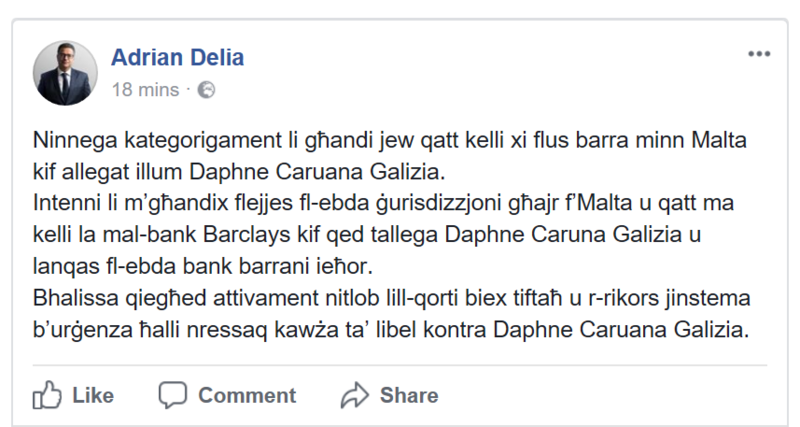 Dr Delia, being a lawyer, is on very slippery ground here, filing a libel suit about a fact that he hasn’t even been able to deny in tonight’s press release and Facebook statement. 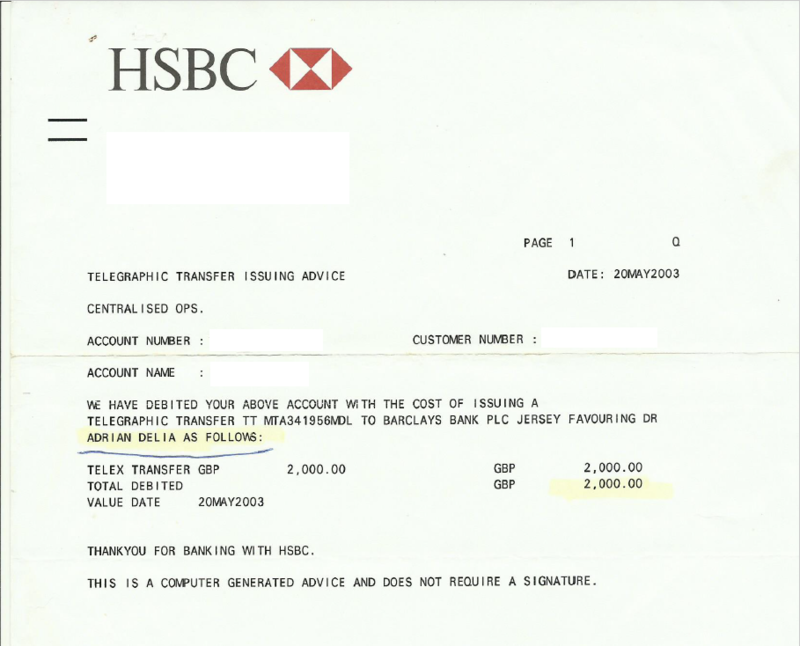 The more sharp-witted among my readers will notice that I published Dr Delia’s bank account number in Jersey, but that number is not on this transaction advice. You’re right. That’s because it’s on another, far more interesting, document that is the real story. And no, I did not mention corruption anywhere in this story. I point that out to pre-empt another non-denial ‘denial’ aiming at confusing people, in which Dr Delia denies something which I never mentioned in the first place.